Spring has become one of the most popular Java frameworks, offering a wide variety of services for applications. Although Spring can be used on multiple platforms, it had gained the popularity through the mechanisms of interaction with the user and through the management and manipulation of data when using an enterprise server. Spring contain many modules, including modules for the client-side application development. One of the strengths of this framework is the ability to abstract the network interactions, providing more pragmatic communication. Representation State Transfer or REST is a type of software architecture that uses verbs and nouns to manage the client-server interaction. Based on HTTP, it supports commands to add data (via PUT), data visualization (via GET), modify data (via POST), and so on. Each URI is a conceptual noun, so that a GET command http://example.com/cat.dat it is refers to the same entity that would eliminate a DELETE command to delete http://example.com/cat.dat. Since REST is not based like server to maintain the client state, it tends to be much simpler and more scalable than other Web architecture. The Key element that the Spring framework offers to clients REST is the RestTemplate. This class supports generate of URI for REST resources at runtime. The framework also provides tools for formatting the responses received from raw HTTP server in response to a usable form by the application. Without any change it can reformat the responses received in binary format or as a string. Inserting and other plug-ins are able to parse and standard answers, such as those in JSON format and with a little work yoy can create your own converter to handle responses from the server. 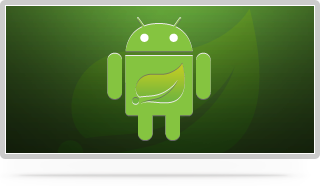 Assuming that you have already installed the Android SDK, Eclipse plugin and ADT, now you need to download the Spring JARs for Android andJackson. Spring Android should not make you any problems in recent versions of Android SDK. For the example I used the version 2.2. After the development environment was configured, now I can create a new Android project Called Tweets. The picture below shows the options you can choose from the wizard for creating a structure for the new project.